زین آبادی, حسن رضا, محمدی, فایق. (1392). پیامدهای توزیع رهبری در مدرسه: نگاهی ویژه به رفتار شهروندی سازمانی معلمان. نشریه پژوهش در نظام های آموزشی, 7(22), 79-100. حسن رضا زین آبادی; فایق محمدی. "پیامدهای توزیع رهبری در مدرسه: نگاهی ویژه به رفتار شهروندی سازمانی معلمان". نشریه پژوهش در نظام های آموزشی, 7, 22, 1392, 79-100. زین آبادی, حسن رضا, محمدی, فایق. (1392). 'پیامدهای توزیع رهبری در مدرسه: نگاهی ویژه به رفتار شهروندی سازمانی معلمان', نشریه پژوهش در نظام های آموزشی, 7(22), pp. 79-100. زین آبادی, حسن رضا, محمدی, فایق. پیامدهای توزیع رهبری در مدرسه: نگاهی ویژه به رفتار شهروندی سازمانی معلمان. نشریه پژوهش در نظام های آموزشی, 1392; 7(22): 79-100. حاضر با درک این ضرورت به بررسی نقش رهبری توزیع شده در این پیامد مهم پرداخته است . با ابعاد پنجگانه رفتار شهروندی سازمانی، تمامی آ نها را نیز به صورت معناداری تبیین می کنند . زین‌آبادی، حسن‌رضا (1388). 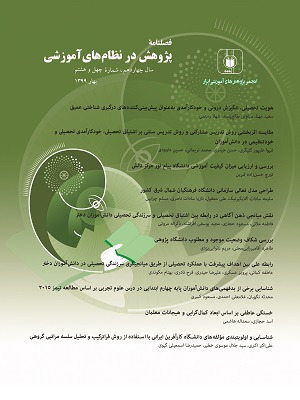 رفتار شهروندی سازمانی، خشنودی شغلی و تعهد به مدرسه: آیا تفاوت معناداری میان معلمان زن و مرد وجود دارد؟ تحقیقات زنان، 3 (1)، 27-4. زین‌آبادی، حسن‌رضا؛ بهرنگی، محمدرضا؛ نوه‌ابراهیم، عبدالرحیم و فرزاد، ولی‌الله (1387). رفتار شهروندی سازمانی معلمان تحلیلی بر ماهیت، روش‌شناسی پژوهش، پیشایندها و پسایندها. نوآوری‌های آموزشی، 7 (28)، 110-75. سرمد، زهره؛ بازرگان، عباس و حجازی، الهه (1383). روش های تحقیق در علوم رفتاری. چاپ چهارم، تهران، انتشارات آگاه. Bambale A. J., Shamsudin F. M., & Subramaniam C. A. L. (2011). Stimulating organizational citizenship behavior (OCB) research for theory development: Exploration of leadership paradigms. International Journal of Academic Research in Business and Social Sciences, 1, 48-64. Bennett, N., Wise, C., Woods, P. & Harvey, J. A. (2003). Distributed leadership: Full report. Nottingham, UK, National College for School Leadership. Blase, J., & Blase. J, (2001). The micro-politics of instructional supervision: A call for research. Educational Administration Quarterly. 38, 6–44. Flessa, J. (2009). Educational micro-politics and distributed leadership. Peabody Journal of Education. 84, 3, 331-349. Gronn, P. (2008). The future of distributed leadership. Journal of Educational Administration. 46(2), 141-158. Groon, P. (2002). Distributed leadership as a unit of analysis, The Leadership Quarterly, 13 (4), 423–451. Harris, A. (2008). Distributed leadership: According to the evidence. Journal of Educational Administration, 46(2), 172–188. Harris, A., & Townsend, A. (2007). Developing leaders for tomorrow: releasing system potential. School Leadership and Management, 27(2), 167-177. Krishnan, V & Arora, P. (2008). Determinants of transformational leadership and organizational citizenship behavior, Asia-Pacific Business Review, 5(1), 34-43. Lambropoulos, N., & Vivitsou, M. (2011), Distributed leadership for interconnected worlds. An Interdisciplinary Journal on Humans in ICT Environments. 7(1), 4-8. Leithwood, K., Mascall, B., & Strauss, T (2008). Distributed leadership according tothe evidence. New York: Routledge. MacBeath, J. (2005). Leadership as distributed: a matter of practice. School Leadership and Management. 25(4), 349 -366. Mascall, B., Leithwood, K., Straus, T., & Sacks, R. (2008). The relationship between distributed leadership and teachers’ academic optimism. Journal of Educational Administration, 46, 214-228. Odur, G. K. T. (2004). Distributed leadership’ in schools: what English head teachers say about the ‘pull’ and ‘push’ factors? Paper presented at the British Educational Research Association Annual Conference, University of Manchester (16-18 September). Podsakoff, P. M., Mackenzie, S. B., Paine, J. B., & Bachrach, D. G. (1990). Organizational citizenship behaviors: A critical review of the theoretical and empirical literature and suggestions for future research, Journal of Management, 26, 513-563. Smith, L. (2007). A study of teacher engagement in four dimensions ofdistributed leadership in one school district in Georgia. Unpublished doctoral dissertation, Georgia Southern University. Somech. A. & Ron. R. (2007). Promoting organizational citizenship behavior in schools: The impact of individual and organizational characteristics. Educational Administration Quarterly, 43(1), 38-66. Spillane , J. (2006). Distributed leadership. Jossey-Bass Publication. Spillane, J. P., Halverson, R., & Diamond, J. B. (2001). Investigating school leadership practice: A distributed perspective. Educational Researcher, 30(3), 23-28. Wallach, C.A., Lambert, M.B., Copland, M., & Lowry, L. (2005). Distributing leadership: Moving from high school hierarchy to shared responsibility. Seattle, WA: Small Schools Project. Yukl, G. (2002). Leadership in organizations (5th ed.). Upper Saddle River, NY: Prentice Hall.